Absolute freedom of movement meets unique and dynamic sound personalization, including Tesla technology with the new Amiron wireless. It combines the flawless sound experience of the legendary Tesla technology by beyerdynamic with the complete freedom of movement that only wireless Bluetooth-headphones can provide. With Amiron wireless, music becomes a dynamic experience in every room and even the finest nuances become audible like never before. The innovative sound personalization via the ground-breaking MIY app takes these closed over-ear headphones to a completely new level of perfection. This makes Amiron wireless the ideal headphones for anyone who wants to enjoy their music without limits and in every room. The human ear differs from person to person and changes greatly in the course of a lifetime – as has been confirmed by latest audiology research. That is why beyerdynamic worked with the German experts at Mimi Hearing Technologies in Berlin to design its wireless headphones. Their common goal: headphones that adapt perfectly to the individual hearing of the wearer like a custom-tailored suit – consistent with the motto of the new wireless line of headphones by beyerdynamic: MAKE IT YOURS. With the unique MIY app (Make It Yours) for smartphones and tablets with Android or iOS, users can create an individual hearing profile using a special hearing test based on Mimi’s research. This allows the sound of the Amiron wireless headphones to be perfectly matched to the wearer’s hearing ability. The profile is then stored directly on the headphones so that they always offer an optimal sound experience no matter the Bluetooth audio source. Another benefit of the app is the possibility to preserve one’s hearing without foregoing excellent sound quality. The wearer can track his daily listening habits and act accordingly. With the Amiron wireless, the audiophile trinity is complete: after the highly praised Aventho wireless on-ear headphones and the unique Xelento wireless in-ear headphones, beyerdynamic now offers an over-ear high-quality Bluetooth solution with the Amiron wireless. Despite the different designs and form factors, all models feature the outstanding Tesla technology from beyerdynamic – a remarkable feat of German engineering prowess. When it comes to other features and ergonomics, the Amiron wireless satisfies highest demands: the latest codecs such as Qualcomm aptX HD and Apple AAC guarantee top sound quality via Bluetooth. The headphones are even suitable for use with modern televisions that feature Bluetooth, as they are capable of low-delay transmission with aptX LL. When hooked up via cable, the Amiron wireless also supports native Hi-Res audio. The legendary Tesla transducers by the German headphone experts ensure that the closed back Amiron wireless amazes listeners with deep, precise bass, full, natural mids and silky-clear highs. The soft cushions, which comfortably surround the ear, support this richness of acoustic detail: ambient noise gets reduced and no musical nuance is lost, be it the gentle plucking of a string or the quiet breathing of a singer. The listener is immersed into their music through the remarkable three-dimensionality and presence of these headphones. When it comes to technical features and ergonomics, only the highest standards do suffice for beyerdynamic. A touchpad integrated in the right ear cup and a built-in microphone of proven beyerdynamic quality make these wireless headphones a perfect accessory to smartphones or tablets alike. Sophisticated design and exquisite materials such as Alcantara® ensure maximum wearing comfort with perfectly balanced contact pressure and fit. This is where highest craftsmanship and decades of experience by the Heilbronn-based headphone manufactory come into play. Amiron wireless will be available online at a recommended retail price of Rs.59,990. 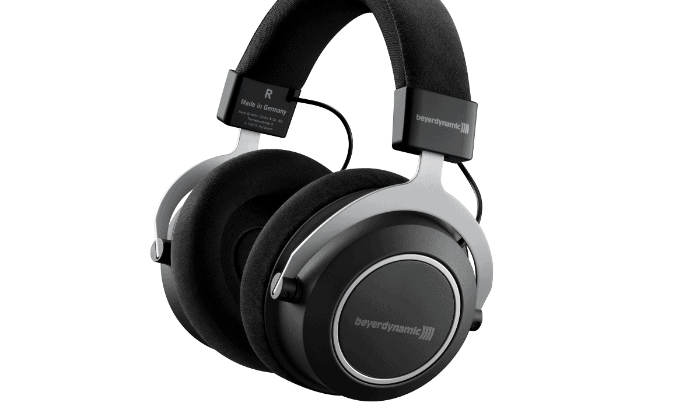 Amiron Wireless Bluetooth Headphones introduced in India by Beyerdynamic 0 out of 5 based on 0 ratings. 0 user reviews.